Shane Shirley : The Perfect Addition to your Weight Loss Efforts...Plus, your entire family will love these gluten free, wheat free and anti-oxidant packed Action Nutrition Bars! The Perfect Addition to your Weight Loss Efforts...Plus, your entire family will love these gluten free, wheat free and anti-oxidant packed Action Nutrition Bars! 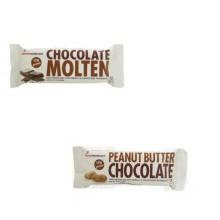 Okay so really I am in love with these yummy and healthy Action Nutrition Bars and there really couldn't be a better time for you to give them a try. It's like today right? Okay, so then yes, this IS the best time to try out one of my family's favorite, healthy snacks. These healthy, packed with protein bars will keep you feeling full longer (great for weight loss) and satisfy any sweet tooth with all natural ingredients. Action Nutrition Bars are packed full of "good for your body stuff" in the form of essential vitamins (like B-12), minerals and anti-oxidants (like Omega-3's). Plus, they are wheat free, gluten free and Kosher! It is not often that I find a super sweet, totally satisfying, chewy and healthy treat that I can feed to my family and know that they are actually benefiting from eating it. My favorite is Peanut Butter Chocolate and my daughter (who is 13) loves the Chocolate Molten. She eats them like crazy which is great as she hardly seems to eat anything at all anymore. The only downside I have found with these "candy" bars is that when the kids eat them, they leave the wrappers all over the house...not a bad downside huh? So what are you waiting for? Go pick up a 12 pack right now! I have had these before from Whole FOods. You sell them too? I will check it out. We certainly do! Just click on the "Shop" Tab above to purchase. Most welcome Green Tea. Have you ordered yours yet?